Scientists may be searching for Earth-like worlds around stars like our sun, but a new study suggests that the best places to look for planets that can support life may be the dying stars called white dwarfs. As cool as white dwarf stars might get, they would still be warm enough to possess so-called habitable zones — orbits where liquid water can exist on the surfaces of those worlds. These zones are considered prime habitats for life, as there is life virtually everywhere there is liquid water on Earth. "If a planet is close enough to the star, it could have a stable temperature long enough to have liquid water at the surface, if it has water at all, and that's a big factor for habitability," said researcher Eric Agol, an astrophysicist at the University of Washington. Before a star fades to become a white dwarf, it usually bloats to become a red giant, destroying any planets as close as Earth. Still, more distant worlds could survive, and once this red giant sheds its outer layers of gas to leave behind a white dwarf, those outer planets could eventually migrate into habitable zones, Agol said. New worlds could also have originated from the ring of debris left over by the star's transformation. Since white dwarfs are so cool, planets would have to be very close to these dying stars in order to be within their habitable zones, perhaps 500,000 to 2 million miles (805,000 to 3.2 million kilometers) away — just far enough away for the star's gravitational field to not rip these worlds apart. The planets would be tidally locked, meaning the same side would always face the white dwarfs and the opposite side would always be in darkness. This is because they would experience very powerful tidal forces due to how close they were to the stars, and their rotations would slow over time to minimize the stresses they would experience. The best areas for habitation for such planets might be toward the edges of the light zone, nearer the dark side of the planet, Agol speculated. Due to the size and distance of the white dwarf, "from the planet, the star would appear slightly larger than our sun, because it is so close, and slightly more orange, but it would look very, very similar to our sun," Agol said. Since white dwarfs are so tiny, if even an Earth-size planet eclipsed the star from the point of view of Earth, the dimming would be significant. In addition, since any planets in a white dwarf's habitable zone are so close to it, their orbits are small and quickly completed, meaning they would eclipse the white dwarf very often from our perspective. "A habitable-zone Earth-sized planet passing in front of a white dwarf would make you see a dip in light of 50 percent, which is a huge dip," Agol told SPACE.com. "If you considered Earth instead, you would only see a 0.01 percent dip if it passed in front of the sun." "The caveat here is that white dwarfs are very small and therefore fairly faint, but despite that fact, if there are Earth-like planets in their habitable zones, these should be easy to detect even from the ground, not space, so you wouldn't need a lot of money," Agol added. This fast, regular, significant dimming could be easily observed using an Earth-based telescope as small as 3 feet (1 meter) across, he calculated. Agol is proposing that researchers survey the 20,000 white dwarfs within a distance of about 325 light-years from Earth. 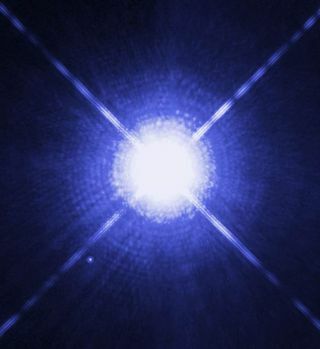 The nearest white dwarf to our planet is Sirius B at a distance of about 8.5 light-years, which packs about the same mass as the sun into the same volume as Earth. Using a 1-meter ground telescope, one white dwarf could be surveyed for a planet after about 32 hours of observation, Agol said. A network of 20 such telescopes with several concentrating on one white dwarf at a time could survey 20,000 of these stars in about 14 years, once the confounding issues of weather and blinding daylight are factored in. Instead, the same work could be accomplished with larger specialty telescopes. For instance, the Large Synoptic Survey Telescope scheduled for operations later this decade in Chile could detect about 10 million white dwarfs over the course of a decade. These embers should be habitable for at least 3 billion years, Agol said. Earth-like planets around white dwarfs might not only be meaningful places to look for alien life, but they could also be potential lifeboats for humanity if Earth for some reason became uninhabitable, Agol said. "Those are the reasons I find this project interesting," he said. "And there's also the question of, 'Just how special is Earth?'" Still, it remains uncertain whether such planets exist. "We don't know at what rate planets might reform after a red giant bloats up or what rate they'd migrate inward at all," Agol cautioned. Agol detailed his findings online March 29 in The Astrophysical Journal Letters.